Description.The ancient Greeks, Romans and Egyptians were very much aware of the healing properties of Propolis and made extensive use of it as a medicine. Propolis is a 100% natural product. Has no side effects. Is a powerful immune booster. Fights aging through elimination of free radicals. Helps your body to protect itself against illness and disease. Propolis Tincture is used internally (colds, flu, bronchitis, stomach ulcers, colitis); an externally (tonsillitis, mouth inflammations, ears inflammations, acne, eczema). Uses.More than 200 individual compounds have been established as the constituents of Propolis. Propolis contains mainly resins, balsams and phenolic aldehydes, waxes and fatty acids, essential oils, pollen, other organics and minerals. The most abundant and the best studied class of chemical constituents of Propolis is the group of polyphenols, which provide pharmacological and very powerful antioxidant properties to the composition. 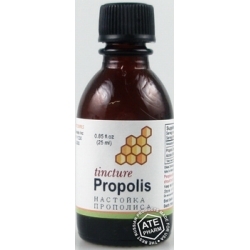 Propolis tincture strengthens the immune system. Stimulates white blood cells. Has a protective effect against virus infections, rheumatic fever, respiratory infections, inflammation. Protects against damage to liver cells. Promotes healing of sores, wounds, acne, blemishes, eczema. Protects the body from oxygen free radical damage. It is apparent, that Propolis has many nutritional and energetic benefits. The daily use has no counter-indications, in addition this product is being 100% natural and non-toxic. 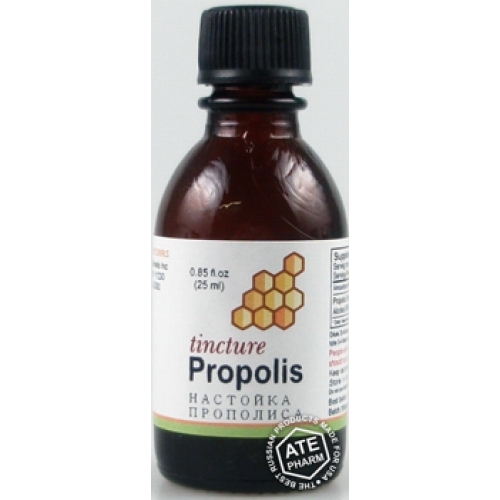 Propolis tinctures do not lose its activity, even when stored for years. Warning! Before using any products, make sure that you have full knowledge of how the product works and any adverse reaction it may cause.